A number of SSRIs were introduced from 1984-1997, including 1) fluoxetine, 2) paroxetine, 3) sertraline, 4) citalopram, 5) escitalopram, and 6) fluvoxamine. 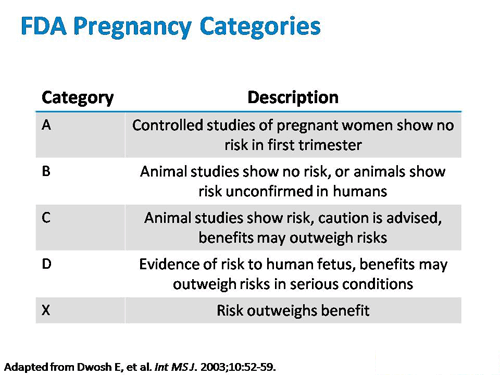 Emerging bodies of data are showing that SSRIs historically classified as Pregnancy Category “C” should be listed as Pregnancy Category “D” or perhaps more aptly, Pregnancy Category “X” as SSRIs have been causally linked to a wide variety of birth defects, including behavioral and cognitive defects, and even Autism using the FDA’s AERS database. The SSRIs are used to treat major depression, and some may additionally be used in treating premenstrual dysphoric disorder and obsessive-compulsive disorder. SSRIs have been actively and directly marketed as therapy to women of childbearing years, (ages 18 to 35) during which time women may become pregnant while taking antidepressant drugs. Thus, the safety of these compounds is of paramount importance given the potential impact on the developing fetus and exposure prior to confirmation of pregnancy and during embryonic development. In the treatment of depression and anxiety disorders, SSRIs are the most frequently prescribed drugs to the point that SSRI antidepressants are one of the most widely prescribed drugs in the United States. According to NHANES and the CDC: “…about one in every 10 Americans takes an antidepressant.” And SSRIs as a class are by far the most commonly prescribed antidepressants. And that: Women are 2½ times more likely to be taking an antidepressant than men, making women of childbearing potential especially vulnerable to give birth to children with serotonin-induced birth defects. In humans, SSRIs and their metabolites, freely cross the placental barrier and are, thus, transferred to fetus, and again to the newborn, during lactation. SSRIs and their metabolites also cross the mother and fetal blood brain barrier. In the mammalian vertebrate embryo, multiple cell types originate from a common structure, the neural crest, which forms at the dorsal tips of the neural epithelium. Neural crest cells undergo a transition and, after a phase of extensive migration, they become widely distributed within the embryo. Therefore, the neural crest gives rise to migratory cells that colonize the embryo. Several animal species show that serotonin receptors are made by the embryo as soon as eight days following egg fertilization. The serotonergic system develops early in gestation and in all trimesters of pregnancy. Serotonin is widely distributed throughout the central and peripheral nervous systems and is involved in the development of multiple brain areas. The development of this serotonergic system is delicate, and even subtle alterations in the serotonin levels, as caused by SSRI drugs crossing the placental barrier during pregnancy, have been associated with changes in somatosensory processing, motor output, and emotional responses, including behavioral and psychiatric complications. Recent evidence suggests that components of the serotonin system are critical to the development of neurobehavioral systems involved in mood, anxiety, aggression, and substance abuse. The serotonin system includes at least 14 sub-receptors, multiple enzymes, and transporter proteins that exert influence on 5-HT metabolism, release, and reuptake. Strong expression of the 5-HT2B serotonin receptor mRNA has been detected in animals as early as at eight days post-conception in the neural fold, neural tube and the “heart primordial” (that is, the heart tissue, before it even starts beating). Neural crest cells are also responsible for the development of the cardiac outflow track and cardiac septal, muscle and valve formation. Specifically, neural crest cells form into diverse cardio-vascular structures to yield the pericytes (contractility cells of the blood vessels and of the heart) and the smooth muscle which make up the all human vasculature, from microscopic capillaries to the large arteries derived from aortic arches. In conclusion: Selective Serotonin modulating drugs are used ubiquitously in adults for extremely broad indications of psychiatric and non-psychiatric conditions. Because of their pervasive use they are causing a broad variety of physical and cogitative/behavioral birth defects. The use of Selective Serotonin modulating drugs can have significant effects on any kind of tissue that serotonin modulates, and serotonin modulates almost all types of tissues in fetal development. The FDA’s AERS / FAERS adverse event reporting system databases details the thousands upon thousands of birth defects that SSRIs have caused. It has been shown in several 2016 publications that the use of SSRIs during all three trimester of pregnancy may be responsible for the otherwise unexplainable increased incidence in learning disabilities and Autisim spectrum disorders seen in the United States. Because it takes at least 1 to 2 months for women to know whether or not they are pregnant, women may unknowingly be taking an SSRI during their first trimester, when serotonin receptors are first developed. Early in fetal development, serotonin receptors have the potential to cause cognitive/neurological as well as visible and physical developmental deformations in the heart, bones and cranium. SSRIs have active metabolites are readily cross the placental and blood-brain barriers. Additionally, SSRIs have a long pharmacokinetic half-life. Pharmaceutical companies have not adequately warned women that if they are thinking of getting pregnant, or have the potential to become pregnant that they should stop taking SSRIs well in advance of a potential pregnancy to prevent the risk of autism and prevent the risk of physical deformations.